15 best places to do street shopping in Lucknow - Markets in Lucknow! 15 best places to do street shopping in Lucknow – Where to shop in Lucknow? Lucknow, The capital of Uttar Pradesh is also known as the city of Nawabs. Particularly considered for its high-quality chicken clothes and beautiful tourist attraction, you cannot have better Street shopping experience then what the dynamic city of Lucknow can offer. Lucknow is much known for its textile industry and lavish food. You would get everything right from the local produce to the important stuff. The street markets of Lucknow are something to die for. Once you visit them, your tourism is definitely going to be a nostalgic one. Let’s discuss some of the most famous markets to do street shopping in Lucknow below. 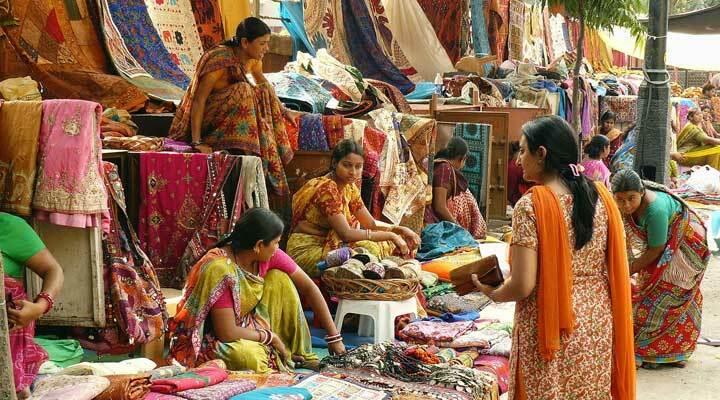 Lucknow street shopping is enough to bring a big smile on the face of any woman. The consolidated range of clothes, footwear, daily utilities, and merchandise are worth exploring repeatedly. The independent shops in Lucknow have Peculiar stuff which much resembles the big brands but have slashed rates. The real fun of bargaining and purchasing high-quality stuff is only possible when you shop at Lucknow. What to shop in Lucknow? When we talk about street shopping in Lucknow, the first thing that comes to our mind is the very famous chikankari. Also, the embroidered women clothes, traditional bed sheets, mats and men clothing also have a role play in attracting the tourists. Lucknow is famous for several lavish Merchandise, jewelry, ornaments and nawabi home decor items. If you have sufficient time to explore the city, do not forget to land on Janpath, Hazratganj, Aminabad and Gadbad Jhala. Particularly known for that exquisite handmade stuff, these places are much versatile and affordable than you can imagine. The collection of nose pins and waistbands in form of exquisite jewelry is absolutely mesmerizing. If you have the love for Artificial Jewelry, the big danglers are immediately going to steal your heart away. The typical Lucknow Bazaar has existed from the era of nawabs. Perhaps one of the oldest places for street shopping in Lucknow has a variety of popular stuff at very genuine rates. So if you are looking forward to grab some Chikan Embroidery staff, Aminabad is the place for it. And since every shopper feels like munching something after the tiresome shopping experience, Aminabad has arrangements for that too. The Prakash Kulfi, kabas and Kachori are primarily the places where you can dine your heart out. Yet another best Lucknow shopping places which is flooded with beautiful ornaments and perfumes. Just 3 km away from Imam Bara, Chowk has interconnecting streets and is easiest to access. You would get best deals while buying toys, nice, lampshades, embroidered garments and traditional Nagra footwear. Also, it has some famous food joints which offer lip-smacking lavish non vegetarian cuisines. The extraordinary Experience At nakhas market is enough to leave you crazy for this city. The residents of Lucknow particularly visit nakhas market on Sunday when it gets packed with very affordable clothes, articles and jewelry pieces. The wooden home decor collection of the place is so beautiful that you would love to carry it all to your home. It also sells small pets and birds fight with more than 12000 shops located at a single place, you can get the most diversified range of merchandise at nakhas market in Lucknow. Just near the nakhas market, another beautiful famous shopping market in Lucknow is yahiyaganj market. The place is famous for the home utility items, kitchen utensils, cosmetics, crackers and artificial jewelry . do not forget to visit this place if you ever come to Lucknow for a mini tourism. Located at Lucknow Kanpur Road, the market as well planned shops which sell vegetables and beautiful Gold jewelry. The paradise for jewelry lovers offers the most luring collection of all time. One of the most visited street market of Lucknow is patrakar puram market that comprises of small shops with unique Merchandise like t-shirts, maxi dresses, and party wear outfits. Surprisingly the place is the favorite of young Lucknow citizens who have favoritism for street shopping. Market of Lucknow everything that that is impressive, affordable, versatile and peculiar. Located at Alambagh market, the place is depositary of most consolidated merchandise. The 200 year old market is actually a famous Lucknow street shopping place which offers specified and customized shopping goods. The place is known to be a part of Hazratganj but is absolutely different from it. It comprises of very affordable shops that let you bargain till the contentment of your soul. The availability of leather belt, shoes, garments and traditional clothes at throw away prices are never better available apart from Janpath market in Lucknow. The market for electronic goods is a key to test your bargaining skills. You might end up paying just the half of what they would have been originally quoted. The place of Latouche road is one of the best street shopping places in Lucknow. Yet another place for street shopping in Lucknow is halwasia. You should never forget to bargain at halwasiya as things are always that at much higher prices than what they actually deserve. The computer market sales computer peripherals like mouse, keyboard, hard disk and other hardware items at very genuine rates. All the branded computer peripherals are best purchased at Naza computer market in Lucknow. The places also known as RSM and is known as Bhoothnath because it has a famous Lord Shiva temple. One of the best market places of Lucknow, bhootnath sells jewelry, electronics and other merchandise. Electronic items are best sold at Naka hindola located near Latouche road in Lucknow. All varieties of Electronics like mobile phone, MP3 player, mobile cover and several varieties of shops are available at Naka hindola. Another famous place which has mushrooming showrooms and lively dotted varieties of chicken clothes is Kapurthala. Perhaps one of the best streets shopping in Lucknow that offers high quality chicken clothes. The self-employed women’s Association is a place to purchase hand stitched chikan clothes at Alambagh. You can reach the famous hand embroidery industries very easily through public transport. Why is street shopping in Lucknow a worthwhile decision? Lucknow shopping is literally incomplete if you have not visited the famous street markets of the place. These places sell traditional items which are not available in the local malls. Also, the prices are so affordable that anyone with a lower budget can own plenty of goods without facing The Pinch of inflation. The handmade embroidered goods and the posh variety of clothes available at street shopping in Lucknow are much better than the typical Mall stuff. The traditional Indian lehenga can never be purchased well than the city of Lucknow. The beautiful city has all the intricacies to make your tour into a lavish one. And the best part is that you don’t have to be a Nawab to shop at Lucknow. Just handful of money is enough to purchase goods at slashed rates.